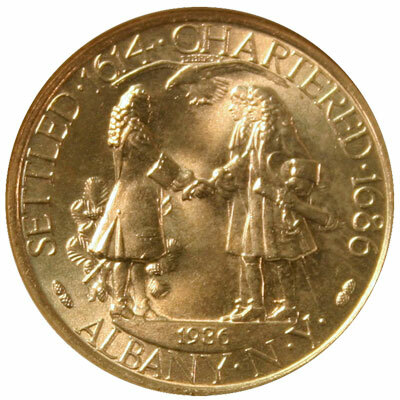 In 1936, the US Mint produced the Albany New York Charter Half Dollar Classic Commemorative Coin to recognize and celebrate the 250th anniversary of the founding of the city of Albany, New York. On June 16, 1936, the second session of the 74th Congress approved an act which became Public Law 74-687 that authorized "the coinage of 50-cent pieces in commemoration of the two hundred and fiftieth anniversary of the founding of the city of Albany, New York." The law began, "That in commemoration of the two hundred and fiftieth anniversary of the founding of the city of Albany, New York, there shall be coined at a mint of the United States to be designated by the Director of the Mint not to exceed twenty-five thousand silver 50-cent pieces of standard size, weight, and composition and of a special appropriate single design to be fixed by the Director of the Mint, with the approval of the Secretary of the Treasury, but the United States shall not be subject to the expense of making the necessary dies and other preparations for this coinage. "SEC. 2. The coins herein authorized shall bear the date 1936, irrespective of the year in which they are minted or issued, shall be legal tender in any payment to the amount of their face value, and shall be issued only upon the request of a committee of not less than three persons duly authorized by the mayor of the city of Albany, New York, upon payment by it of the par value of such coins, but not less than twenty-five thousand such coins shall be issued to it at any one time and no such coins shall be issued after the expiration of one year after the date of enactment of this Act. Such coins may be disposed of at par or at a premium by such committee, and the net proceeds shall be used by it in defraying the expenses incidental and appropriate to the commemoration of such event." The coin's estimated value ranges from $230 (low grade - XF) to $450 (high grade - MS-66). Extraordinary characteristics on the Albany New York Charter Half Dollar can command a price outside the estimated value range. The obverse or front of the coin shows the full-length portrait of Sir Thomas Dongan, Colonial Governor, presenting a charter to Pieter Schuyler, Albany's first mayor, and Robert Livingston. Also pictured is an eagle in flight above the men, a pine branch, and cones. The coinage inscriptions say, Settled 1614, Chartered 1686, Albany NY, 1936, and Liberty. 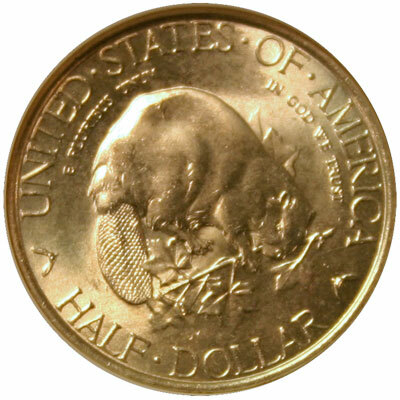 The reverse or back of the coin features a beaver chewing on a branch of maple seeds. The coinage inscriptions read United States of America, E Pluribus Unum, In God We Trust, and Half Dollar. Records show the Philadelphia Mint produced 17,671 of the Albany New York Charter half dollar coins, which is less than the delivery number specified in SEC 2 of the law. Perhaps too many commemorative coins flooded the market in 1936, or perhaps there was not enough interest in the coin. Regardless, many of the coins were returned and melted for recoinage. Prior to receiving the Charter, Pieter Schuyler and Robert Livingston were appointed Commissioners by the town of Albany. The Magistrates of the city ratified their appointment. As Commissioners, they went to New York to obtain the Charter as agreed to between the Magistrate and Colonel Dongan, Governor-General of the Province of New York. The Charter appoints the Mayor, Common Council and other officers of the city, which included Pieter Schuyler as Mayor and Robert Livingston as Clerk. After receiving the charter in July 1686, the first meeting of the Mayor and Alderman was held at the end of August in their City Hall. Initially, the official seal of the city of Albany included a crown above the letters AB. Sometime after 1736, the city seal included the letters ALB above a beaver. In 1752, the official seal became a beaver with ALBANY above and 1752 below. But, there was contention in the city about the various seals. In May 1755, two seals became valid, the early one with the crown and the 1752 version with the beaver. On October 16, 1761, the Common Council determined only the city seal with the beaver would be valid. Today, the official seal of the city of Albany still contains a beaver as he cuts down a tree. The beaver and his tree are in the upper portion of a shield positioned between two men, one of European descent and one an Indian. Below the shield and men is the word ASSIDUITY, which means constant or close application or effort; diligence; industry. Visit our GACS Numismatic Shoppe Albany New York Charter for a variety of useful items decorated with images of the classic commemorative silver half dollar coin.